Looks like the real fun is just starting over at the City Centre construction site on the 300 Block of East State Street. With the piles in and foundation slab poured, work is starting to head skyward. The structural steel frame is being assembled, generally from east to west, beam by beam, and bolted into the concrete-encased structural support columns that will transfer the weight of the upper floors into the foundation and bedrock. Some of the exterior foundation walls are still being formed, but where it’s more further along, the steelwork has progressed far enough with its columns and cross beams that corrugated steel decking has been laid. Meanwhile, work continues on forming and pouring the concrete for the stairwell and elevator columns. The entrance to the underground parking garage is pretty close to where the Green Street construction entrance is. The ground level will have a courtyard driveway accessed from South Aurora Street, but will not have a direct connection to the garage below (the armchair cynic suspects that will mess around with people for years to come). Purcell Construction has a webcam set up, which shows the construction progress to date. Steel is rising rapidly on the curved northwest corner. It’s pretty fascinating to watch months of construction in 51 seconds. 1. Let’s start off with some bad news. Than Lansing Star is reporting that developer Eric Goetzmann is in serious trouble. The village of Lansing Planning Board rejected his latest request for the Lansing Meadows senior housing component, which was to build twelve units on a fraction of the lot, and leave the rest vacant. Frankly, they liked the units, but the vacant and potentially saleable lot was too much for them to overlook. To be honest, they and the village Board of Trustees have been fairly accommodating to his other requests, but this seems to be the last straw, and they let him know it. They will consider the latest revision, but only as a major revision, not as the minor change Goetzmann had hoped for. That means it will take months to go through the procedural review and vote. Meanwhile, the IDA has initiated legal action because Goetzmann failed to hold up his end of the deal they agreed to when he received his abatement back in 2011. Some projects are successes. Some break even, some don’t turn out as well as hoped. But as Lansing Meadows goes, this is neigh close to a disaster. The plan calls for roughly 1,350 SF units with ground-floor garages. They’re intended to be marketed towards seniors looking to downsize, and young families. The developer is Robert Poprawski, who runs a small hotel group (Snooze Hotels) in metro Fort Lauderdale, Florida. Poprawski is a 2005 Cornell graduate, so there’s the likely local connection. The planning board is supportive, but the big issue will be the driveway – they would prefer the townhomes share Sevanna Park’s driveway. That’s tricky because Sevanna Park’s road is privately owned. Not impossible to make a deal, and it would likely have the village’s benediction, but it’ll take a little while to see if a deal can be made between Sevanna Park’s HOA and Poprawski (all things considered, given that a much larger retail/office building and parking lot could be built on the combined lots, 12 more homeowners doesn’t sound like a bad option). The village is also reporting there are development plans for the balance of the Millcroft property (the 32-acre remainder of the parcel, once intended for luxury single-family homes, has been for sale for a while), and vacant 4.56-acre 9 Dart Drive. The Ramada Inn (correction: the new extended-stay hotel proposed behind the Ramada) and Target are the only businesses interested in buying their properties from the mall’s owner, and Bon-Ton’s on deathwatch. The town’s code and planning officer notes that if it weren’t for Namdar Realty buying the mall, it would have failed, which would have forced the remaining tenants out and turned the mall into a vacant husk, to say nothing of the property tax implications. 3. Let’s shift over to Dryden. It’s been rumored for a little while that 1061 Dryden, aka the “Evergreen Townhouses”, would be trying to shift towards a smaller footprint – here’s the plan. The approved proposal calls for 36 3-bedroom units, six strings of six units. The reduced size plan still has six strings of six units, but the middle four have been reduced to two-bedroom units. The total occupancy goes from 108 to 84, and the footprints have shrunk as bit. Old render at top, new renders at middle, new site plan at bottom with new footprints in red. HOLT Architects’ design is generally the same, though I have an armchair critique with the rear flanks of the strings – a window opening would do a lot for aesthetics, if the floor plans permit. (You can check the town’s website for docs, but some webpages have been hacked and replaced with a phishing scam, so use caution). According to Dryden town planner Ray Burger, the developer, Lansing businessman Gary Sloan, would like to start construction this summer. That would put these units on track for an opening in time for the 2019-2020 academic year (in other words, about 12-14 month constriction timeline). 4. Another project moving forward – 118 College Avenue in Collegetown. This is a Visum proposal to replace a five-bedroom house with a 5-unit, 28-bedroom apartment building. The project was approved by the city early last year. According to the advertisements on Zillow, rents are expected to be $1,200/person, plus utilities. I asked Visum’s Patrick Braga to confirm, and he replied that building permits would be approved “any day now”, so they’re probably looking at an August 2018 opening. With regards to a follow-up inquiry about its near-identical twin planned for 126 College Avenue, Braga replied they he does not “have any information on the status” for that project. 5. The new Greenstar West End store. Maybe coming soon. According to the news release, if the membership approves the move, the new store would be open at 750 Cascadilla Street by November 2019. The expansion would more than double their floor space, and add sixty living-wage jobs. Membership will vote on the plan next month. The above render is courtesy of STREAM Collaborative – even without their logo, their software relies on the same pack of white Priuses, Volvos, and Touraegs to fill parking spaces (my family of mechanics would be proud I use vehicle models as a telltale attribute). The design is attractive for a big box – it has shed roofs and exposed wood trusses that give it a warmer, less industrial appearance. For the record, STREAM also did 118 College Avenue in the previous tidbit. 6. Honda of Ithaca has been sold to the Maguires for $3.5 million. The sale was recorded with the county clerk on the 20th. The acquisition means that Maguire represents just about every major vehicle make in the Ithaca area. It also drew some impassioned responses regarding customer service experiences, which given Maguire’s very visible presence, is not to be unexpected. According to county records, the 27,558 SF dealership was built in 1985 as Cutting Motors Buick-Pontiac-GMC, and sold for $1.8 million in 2009. It was renovated and expanded in 2012; the portion closest to Elmira Road is the expansion space. 7. The Lambrou family’s latest project is coming along. Being built at 123 Eddy is a contextually-sensitive two-family home at 123 Eddy Street. While modular, the home was designed to have features respectful to its location in the East Hill Historic District – this includes a double-decker porch, roof brackets, shake siding and decorative columns and railings. The new three-bedroom units should be ready in time for the 2018-19 academic year. 8. Quick note – building permits for both the Amici House residential and head start/daycare buildings have been filed and granted by the city. The Harriet Giannellis Childcare Center’s hard costs are estimated at $1,267,479, while the 23-unit residential portion’s hard costs are estimated at $3,627,333. Welliver will be the general contractor. Although vague, this is like for the former Salvation Army property at 339 Elmira Road. U-Haul purchased the lot in January 2016 from the development group that planned and cancelled a hotel for the property. As noted on the Voice recently, there’s been a building boom in self-storage facilities lately. The most plausible guess for this corporate-owned property is that this will likely take after the chain’s default design for self-storage facilities, with maybe some modest aesthetic differences. Not especially pretty, but the city would probably prefer that over a parking lot for U-Haul trucks. 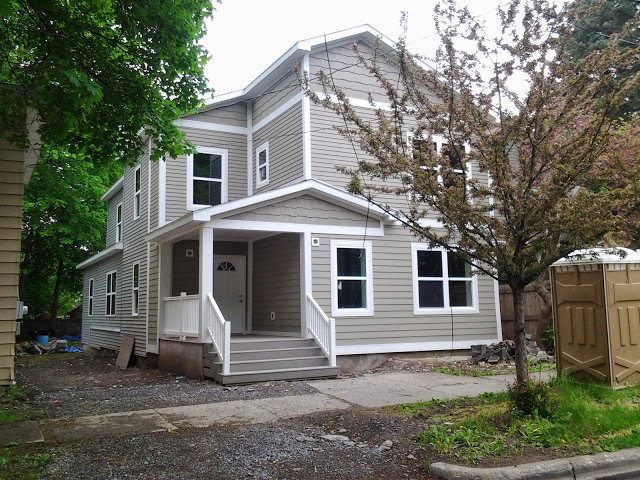 207 and 209 are a pair of run-down rental two-family homes in Ithaca’s Northside. After the previous owner passed away, they were sold to local businessman David Barken in June 2017. Barken previously caused a stir in Fall Creek when he bought, renovated and sold a Utica Street home for a much higher price (he said on the list-serve it wasn’t intended to be a flip, it was intended for a family member who decided to live elsewhere). Barken purchased the home for $160,000 in September 2016, and it sold for $399,500 in June 2017. He also rents out a couple other units in Fall Creek. “While in its beginning phases and still taking shape, I have no intention to tear down the existing homes. Instead, I plan to steadily improve these properties, working on both the exteriors and interiors as the planning phases for any future project moves forward. The concrete elevator core and stairwells are on the rise at the Hilton Canopy site on Seneca Way. The center one is the elevator core, the two adjacent to the foundation walls are stair columns. The foundation walls aren’t fully complete yet, forms are in place for future pours towards the southwest corner of the building’s footprint. But all in all, moving along fairly well, and the start of steel structural framing is probably not too far off. Fun side note, it appears the Canopy brand has a dog-friendly policy. Convenient for the visitor with a four-legged fur child. Canopy, as a “neighborhood-focused lifestyle brand”, is designed to appeal to upscale travelers. It’s described as having a more contemporary focus, with an emphasis on tech-friendliness and local services beyond the hotels themselves. You probably won’t see a Canopy at a suburban highway exit. Urban spaces with a lot of street life are their key geographic segment. About the only major exterior facade work left on Tompkins Financial’s new headquarters is the stone veneer on the front face. I don’t have information on file on what kind of stone it is apart from a generic “stone veneer” description. It may be cast stone, a concrete masonry product mixed and molded to resemble natural-cut stone. Over the blue and black air/vapor barriers, Dow TUFF-R polyiso rigid foam insulating boards are being laid between rails. Atop those, a second set of steel rails, called continuous anchors, are attached to the building. When the polyiso is attached and the rails are screwed on, the stone panels are slid into place, and then they’re mortared or caulked with silicone. There will be a gap between the polyiso and the stone that serves as a drainage cavity for water that gets absorbed and needs to be eliminated. 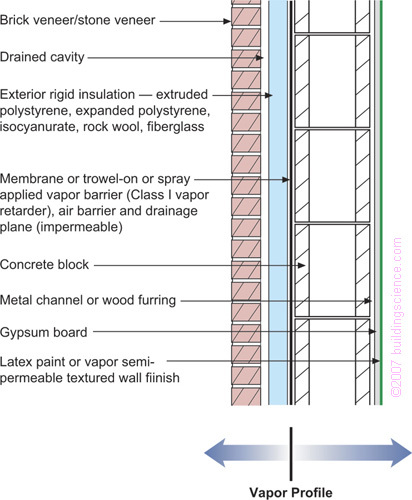 The whole process is about keeping moisture from seeping inward and damaging the more sensitive building materials like the gypsum boards, while allowing any latent moisture in the materials (having been exposed to the elements during construction) to escape outward. The entrance canopy is up, and steel clasps for the sunshade installs on the front are ready for when the facade is nearing completion. The lights are on, and one can presume that with three months left in the schedule, most of the big interior tasks (utilities, drywall, fixtures) have been completed. Parts of the granite base appear to be in place, but most of the ground floor and its parking area remain a work in progress. Not all cranes come on wheels. Many larger cranes are assembled and disassembled on site. A concrete crane pad is formed and poured to provide a base for the crane, with the pieces assembled upward from the base. That’s what you can see in the photos below. The size can vary depending on the size of the crane required, whether it’s free-standing or tied-in, whether there are rock anchors that can be used, and the soil upon which it and the pad will rest. Here, the crane pad will rest on a thick, firm mud layer beneath, and the concrete will be reinforced with a tied-in (meaning the grid bars are tied together) steel rebar grid. According to the Harold’s Square website, the crane pad itself will rest on a 4’6″ deep concrete, 38′ x 38′. Keep in mind, there will actually be two cranes on-site. The one mounted here will be the heavy-duty 300-ton crane, but they construction team will use a mobile 55-ton crane as well. The elevator pits are also being boxed and formed. All the piles have been driven in at this point, and the sides of the site have been shored up as necessary with lagging and steel H-beams. The low-rise Commons-facing portion of the building will utilize an 18″ rebar-reinforced mat slab foundation, while the tower portion will have a 30″ rebar-reinforced mat slab. These pours should happen by mid-March. The structure will be anchored into the foundation, which will evenly distribute the weight and support the floors above. After the foundation is in, the only way to go is up. The wood frame for the eleven-unit 107 South Albany Street project is now up to the second floor. ZIP panel sheathing has started to be attached and interior stud walls have been erected. It does not appear utilities rough-ins have started on the ground floor yet. The project recently underwent a last-second but substantial design change. It doesn’t affect the interior square footage (something that would have sent it back to the Planning Board), but the aesthetic have changed up quite a bit. The tall mid-building stair column and flat roof with cornice have been ditched in favor of a less prominent stairwell with a small gable, and a large hipped roof. The fenestration and ground floor details remain largely the same. Before and after renders are at the bottom of this post. “Brand new luxury 1 bedroom apartment in Ithaca’s newest development available August 1, 2018. One block from the Ithaca Commons and a bus stop with multiple routes at your door. – Boasts high end finishes throughout including: custom cabinetry, quartz counter-tops, stainless appliances and a beautiful tiled bath. It’s a bit of a risk, since the real estate waters are generally untested west of Ithaca’s downtown, although a couple other small projects are planned along the State Street Corridor. Long-time residents also worry about gentrification encroaching on the edge of the Southside neighborhood. However, city planners are pushing development westward from the downtown core, and the possibility of a government center on the Central Fire Station site a block away means that there may soon be a large employer practically at its doorstep. The Facebook ads are pitched with an eye to students, but that seems a stretch; even with the buses, this is a bit too far out for many Cornell or Ithaca College kids to consider, and it’s double the per bedroom price of shared South Hill, Fall Creek or outer Collegetown units. The developers, the Stavropoulos family, don’t seem especially inclined towards any one neighborhood. Previous projects include a pair of duplexes in Fall Creek, a new home on Linn Street, and home additions on South Hill. The Stavropoulos family’s next project after this would potentially be the duplex pair at 209 Hudson Street on South Hill, if approvals are granted. Arguably, South Hill is a safer bet financially thanks to Ithaca College, though becoming less amenable due to the concerns from permanent residents regarding quality-of-life manners, which has led to a new zoning overlay to rein in infill in that neighborhood. There is so much going on here – it kinda blows my mind because a development of this acreage and number of units is extremely rare in a place like Ithaca, where highly subdivided lands make large acreages difficult to find or assemble, the financial and labor capacity for a large build is limited, and review processes are stringent and rather burdensome. With the exception of a few townhouse strings towards the middle and the community center, it looks like almost everything else has moved into the framing stage. In contrast to the renders, the townhouse strings are showing greater color variation in their brick and fiber cement panels – some are navy blue boards and orange-red brick , while others are jade green boards with maroon brick. Same goes for the apartments, some of which have a navy/orange-red scheme, while others are faced in different shades of grey panels. This helps to create more visual interest and differentiation between otherwise similar structures. Embedded below are a couple of mock-ups from the on-site display unit inside the leasing trailer. It’s not a bad setup, though on a random note, no one in their right mind would hang a picture frame so close to the top of their bed. The units will come furnished. For those interested, the rental website can be found here. Also included below at the end are a few interior renders, of the community center, a study lounge, the fitness room and a bathroom (not a part of the walk-through mock-up). For project background and planning, click here. For a site plan breakdown, click here. For a construction timeline, click here. Webcam link here (updated ~15 minutes).